Fez, Morocco sometimes written as Fes, Morocco was the capital of the country until 1925 and has long been considered the spiritual home of the country. The Fez medina is one of the largest car-free zones in the world and is a UNESCO world heritage site. It’s been dwarfed in recent years by larger and more tourist-oriented Marrakech but offers visitors a different look at Moroccan life. 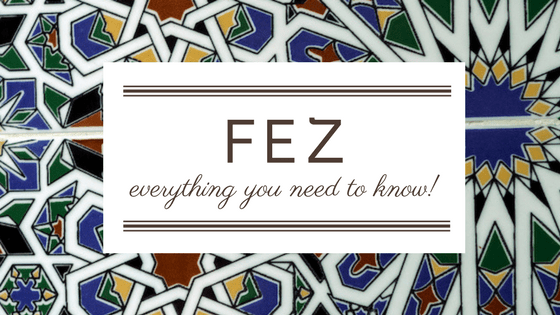 Modern day Fez was founded in 789 by Idriss I on the Jawhar River that runs through the city. 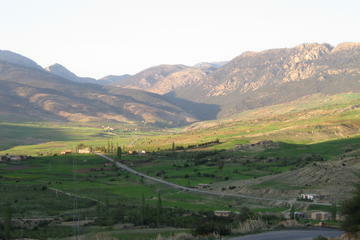 It is in the north of the country sandwiched between the Rif Mountains and Middle Atlas Mountains. Within 50 years there were two large waves of immigrants that came to form settlements, one on each side of the river. 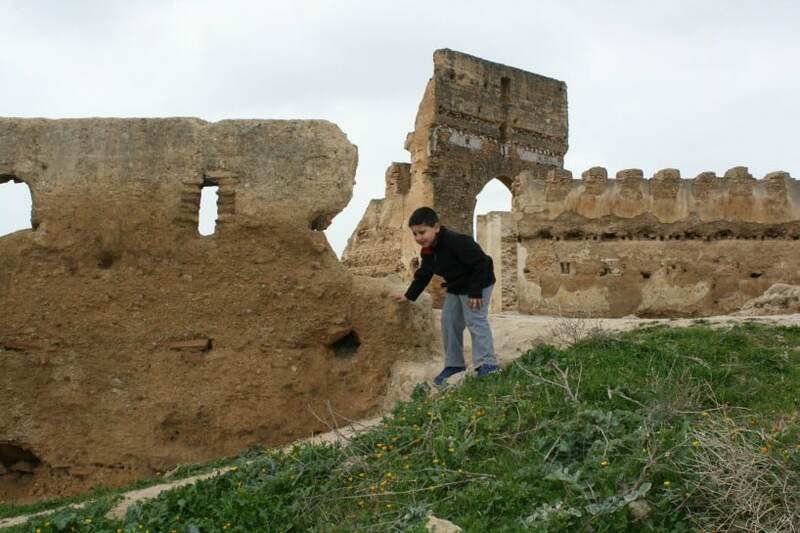 800 families from Andalusia arrived and settled what is today “Old Fez” while 2000 families banned from Kariouan Tunisia formed New Fez or al-Aliya. This would later become an issue as the Caliphate of Cordoba and Caliphate of Tunisia contested who ruled the city. 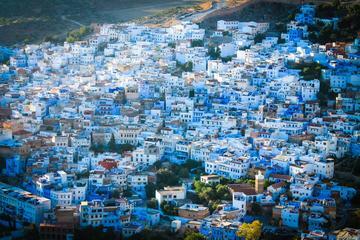 By 1070 it was resolved as the Almoravid dynasty united the city both figuratively and literally as they broke down the walls that divided the settlements and united it into one medina. From 1170-1180 Fez grew to become one of the largest cities in the world and the city walls that were put up during this time still form the outline of Fez el Bali today. From 1271 to 1357 huge strides were made especially in education as seven madrasas (schools) were built in Fez and it became a center of Islamic education. Many people visit Fez to see the Jewish quarter. 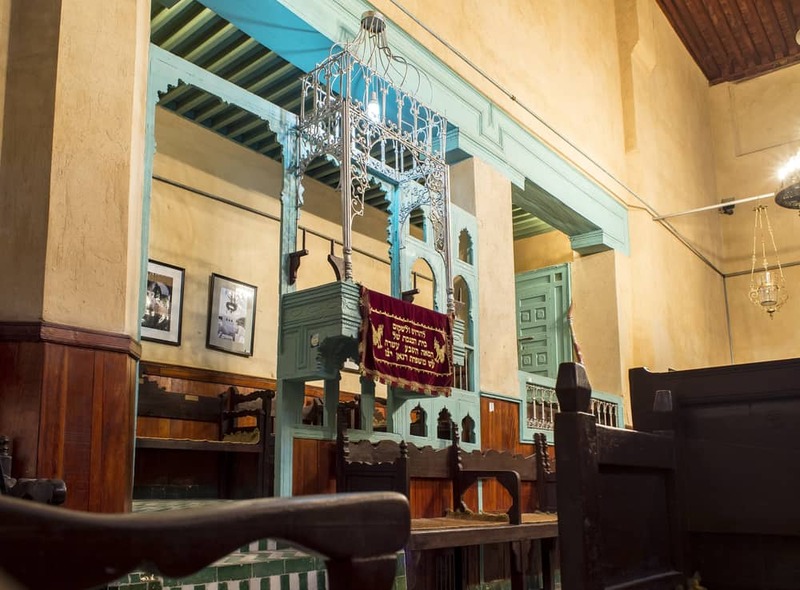 The mellah was built in 1438 near the royal palace and exists today. Other dynasties would follow; the Marinid, Wattasid, Saadians and nearly the Ottoman Empire. 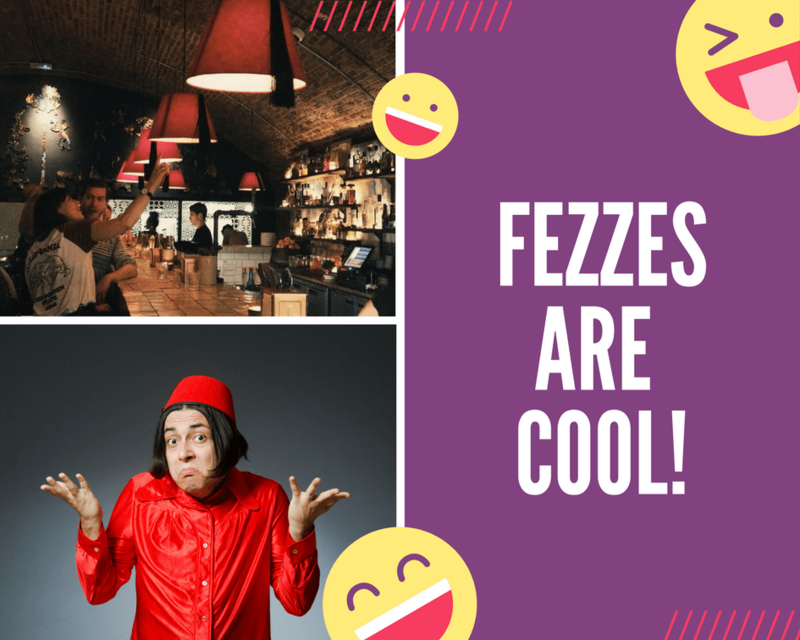 From 1649 Fez was an important trading post on the Barbary Coast and was the only source of “fezzes” the signature red, tassled hats until the 19th century. The red color comes from a berry that grows outside the city. In 1790 it became independent and by 1795 control returned to the kingdom of Morocco where it was the capital until 1925. It was the 1912 Treaty of Fez that made Morocco a protectorate under French control. In the 20th century a new area of Fez grew out of the French protectorate, the Ville Nouvelle. In 1981 UNESCO designated the medina of Fez as a world heritage sight and the famous World Sacred Music Festival began in 1994. 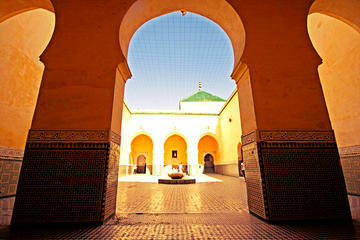 Take time to decide what you’ll want to see when you’re in Fez. There are many historical sites though not all are open to the inside. Are there secrets in Fez? Of course, and this is one of them! These ruins are located on the hills above the Fez medina and while there are still some inscriptions no one really knows who is buried here or the story behind the ruins. It’s a good spot to go with kids (open space and no vehicles), and provides great views looking down on the medina and surrounding mountainside. Located near the famous Karouine mosque and university, this school was built in 1323. The spice and perfume market is on the edge of the spice and perfume market. 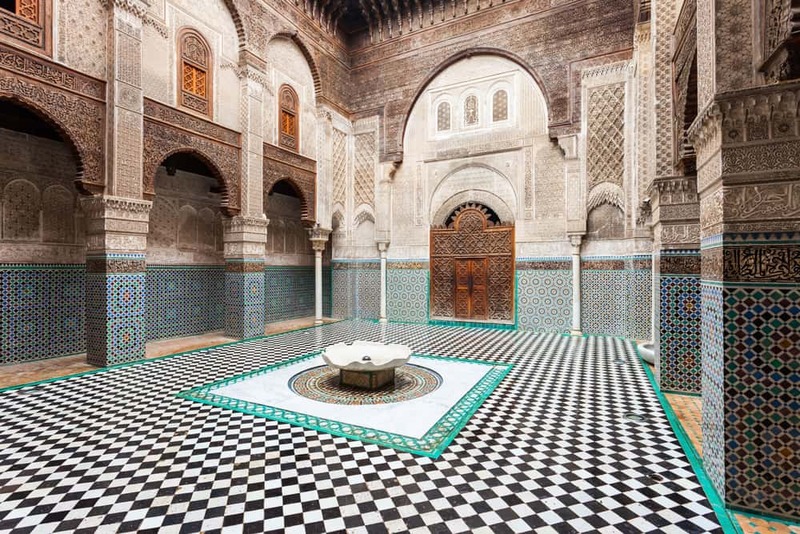 Inside you’ll find a gorgeously designed courtyard and hand-laid tiles adorning the floors and walls. The oldest degree granting university – and still in operation – in the world is something to see. Even more interesting, this school and mosque was founded, funded and built by a woman – Fatima al-Fihri. The mosque portion is not open to non-Muslims but there is an entryway that you can look into. Recently the library (the oldest in the world!) connected to the university was restored and is open to the public. This is only one of what once were several synagogues in the medina of Fez. It has recently been renovated and saved from near destruction due to disrepair. It was built in the mid seventeenth century by a local family and is still privately owned. It is open to visitors. You can also visit the Jewish cemetery located in the southwest corner of the mellah. The cemetery is still in use. 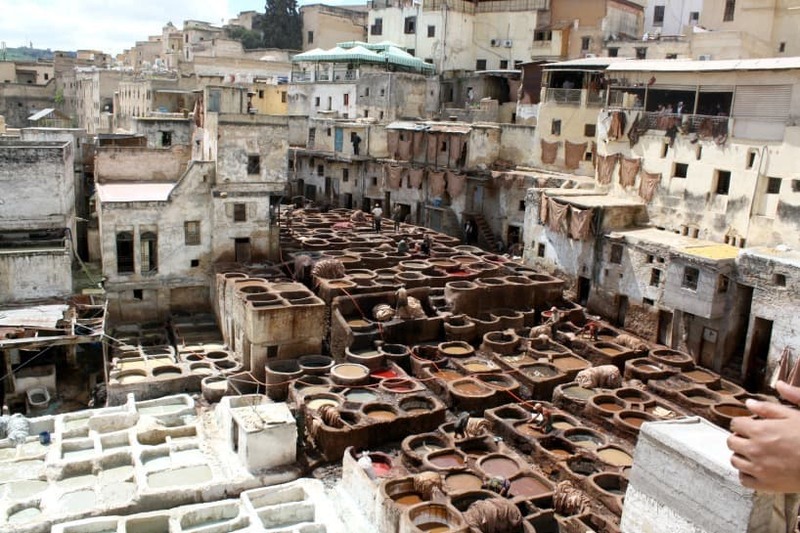 If you’ve seen a picture of Fez you’ve no doubt seen the tannery vats. This is one of the most visited sites in the city. You’ll want to brace yourself for an overwhelming smell, especially in warmer months but it’s a step back in time to see leather being prepared as it has for centuries. Don’t feel pressured to buy leather goods here, you’ll have better luck negotiating a better price elsewhere. You should be prepared to offer a small amount to shopkeepers if you’re brought onto their balcony and given an explanation. Some will ask, some won’t so play it by ear – even better to visit if you’ve hired a city guide for the day. This museum has been created in a restored fondouk (a boarding house/caravan stop). The inside has been completely restored to how it might have looked in the past. However, photos are not permitted. There is a cafe on the rooftop as well that offers some lovely views of the city. This is my favorite area of the souks because it feels like a scene right out of a movie. Here you’ll see metal workers working by hand to hammer out designs and unique items. Watching the amount of work and care that goes into creating each of these pieces is something to witness. If you want to bring home metal work like lamps, this is the place to go. 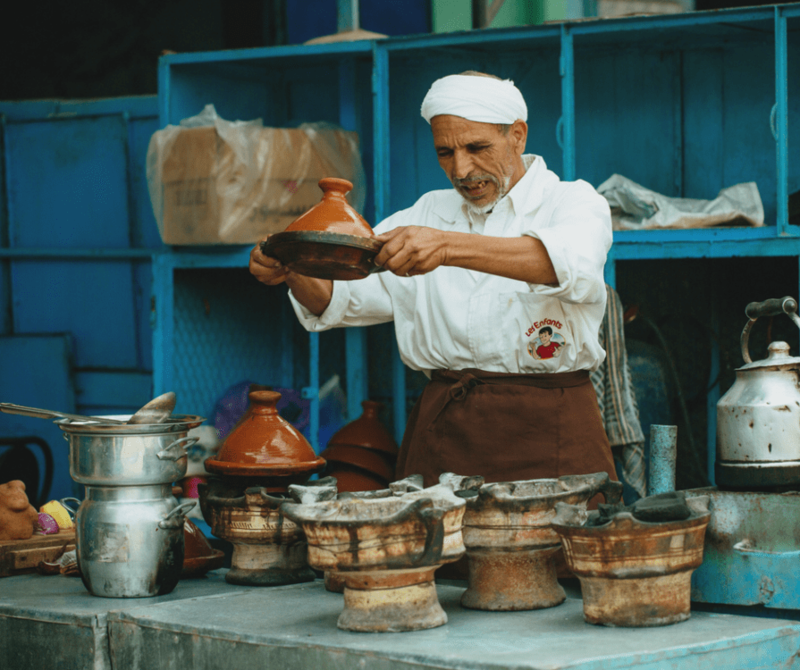 Bread Making Class at the Ruined Garden – Learn how to make Moroccan bread! Craft Draft – an art studio working to keeping Moroccan craftsmanship alive by offering a variety of workshops. Cooking Class – I haven’t done a specific cooking class in Fez but several offer them. Here are two options worth considering. Cafe Clock also offers courses. Once a year the World Sacred Music Festival is held in the city. Musicians from around the world attend and preform at the festival with activities held around the city. Entrance to some performances require tickets while others are free and open to the public. Usually the festival is held in May or June. In October the Sufi Culture festival is celebrated over 8 days. There are a series of musical performances and intellectual presentations and debates to celebrate Sufism. There are a wide variety of performances and events scheduled over the course of the festival. Fez has always been home to great craftsmen. There is no shortage of beautiful things to see and buy. Need to buy some groceries or looking for something from this decade? Head to Borj Fez, a mall located a bit outside of the medina of Fez. 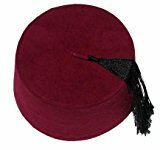 The tarbouch, also known as the fez were first made in Fez (hence the name)! Today they’re still popular thanks to shows like Dr. Who, and you can pick up one of these cool hats when you’re in the city. You’ll find cheap cardboard versions and more expensive, well constructed pieces. Can’t get to Fez or don’t want to carry one? Good news – you can buy them online! Looking for traditional Moroccan food? Fez has a great food culture no doubt due in large part to it serving as the royal capital for centuries. When you’re looking for a change from Moroccan why not try Thai? 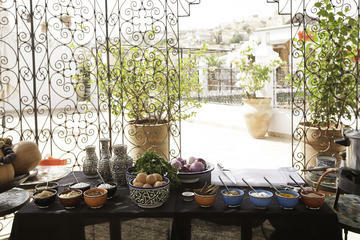 Stop by this beautiful restored riad for lunch in their beautiful garden. The menu is a Mediterranean/Moroccan mixture and there is alcohol available if you imbibe. Dar Ramouna – For delightful French/Mediterranean cuisine book a table here. 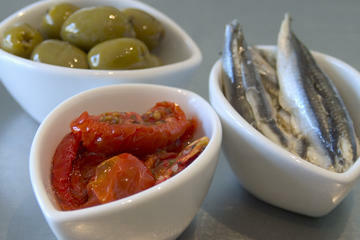 The menu revolves daily and around the seasons so you’ll have to be surprised by what is on offer. There’s only 5 tables available each night so reservations are needed. A perennial favorite among visitors is Cafe Clock and their infamous camel burger. Stop in for free WIFI as well as great milkshakes. Located just inside the blue gate this is one of the only restaurants in this area I would recommend. Home cooked Moroccan at fair prices and with the flavors you’d find at home. We love to venture to the Rcif neighborhood market for street food in the evenings. Grilled meats and more to go! 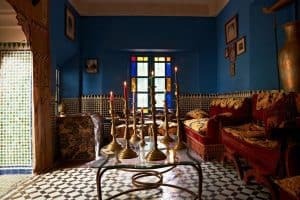 Staying in a Moroccan riad is a must when you visit, but keep in mind they don’t exist in all cities. 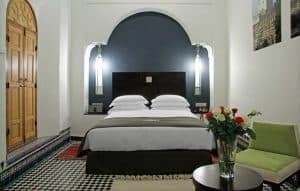 Luckily you can find great riads in Fez! 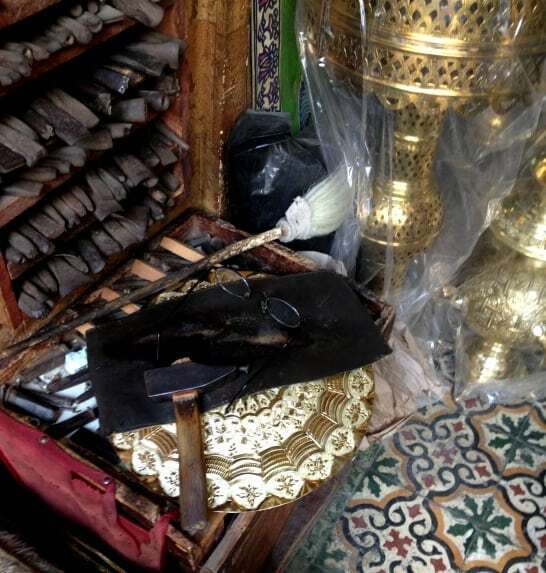 However, if you’d prefer the comforts of a hotel, you can find these in Fez as well. 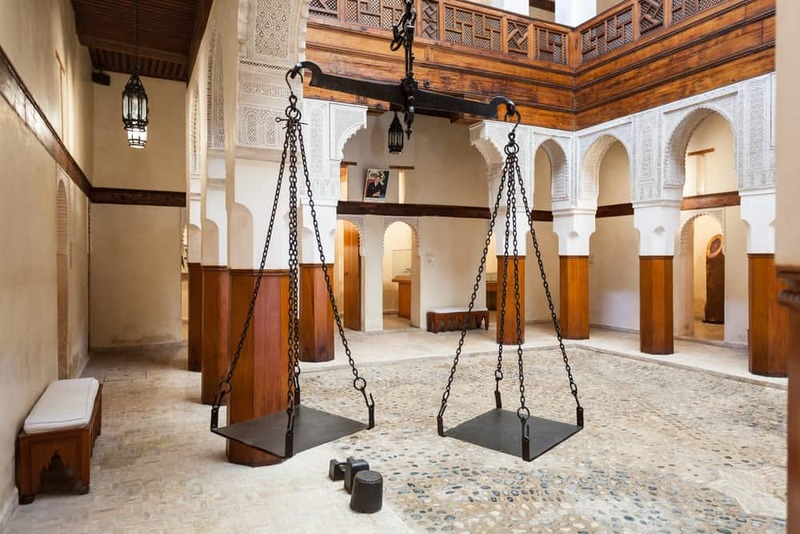 This former palace in the heart of the medina has been remodeled and now operates as a hotel. 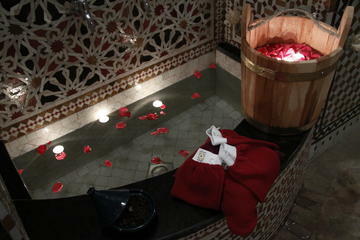 Along with an all-inclusive breakfast there are on-site spa treatments such as a hammam available for guests. It took 10 years for this gorgeous riad to be remodeled. At the bottom of the medina in the Rcif neighborhood you’ll have a different experience than if you stayed in the central medina. It’s quiet location and gorgeous ambiance is worth the stay. The recently (2015) refurbished and is a new Marriott property. It offers a great swimming pool and large breakfast for guests. If you want to stay outside of the medina in the Ville Nouvelle, this is a great option. 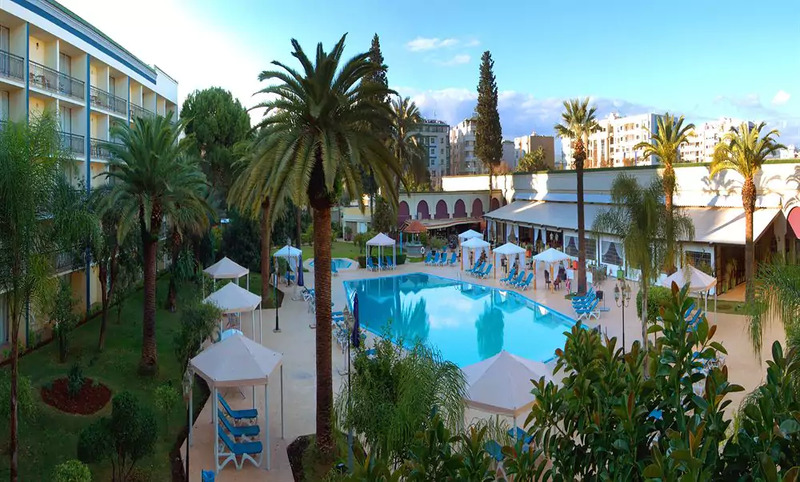 If what you’re seeking is a budget option in Fes consider the Ibis. 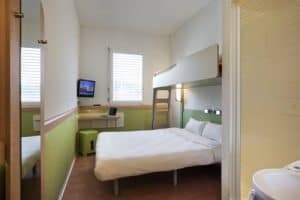 Rooms have air conditioning and are basic but clean. The hotel is approximately 3km from the train station. There is also a Marjane grocery store across the street if you’d rather pick up something to eat or drink. Expect a gorgeous courtyard, hammam, and unique rooms at this centrally relocated riad. Join one of their cooking classes or a meal in the restaurant. Another bonus is the shuttle that operates to and from the airport. 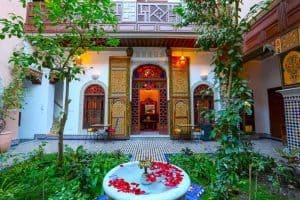 In the central Fez medina, this small riad offers plenty of luxury and privacy for a fair price. If you’re visiting Fez via vehicle, car parking is very nearby which is hard to find in the area. There are different size rooms available, so book early for the view and size you’d like. This former palace and vizir’s residence has been lovingly restored to its original splendor. There is an indoor swimming pool, hammam, and onsite spa available for guests. 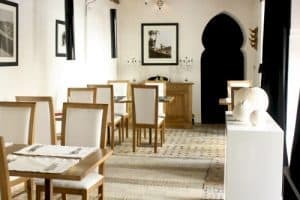 A great restaurant that serves classic Moroccan dishes for lunch and dinner is a bonus of the stay. Fez is a great place to make your base for further discoveries of the surrounding area. There are so many great destinations that can easily be visited and don’t require an overnight stay to enjoy. This might be the longest day trip to take but if you hire a driver it will be much easier to do. We went here on a day trip to check out this cheese farm! It was an excellent day trip that our kids really loved and got us into the surrounding countryside. The most un-Moroccan city in the country is really unique and a perfect day trip for anyone that enjoys taking walks/hikes in the forest. One of the oldest historical sites in the country, these Roman ruins are more than 2000 years old. There isn’t a lot of shade and quite a bit of walking so keep this in mind if you plan to visit. I highly recommend going with a guide who can provide some context as well. 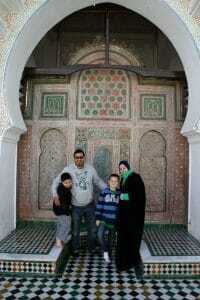 You have changed the way most of the tourist think about Marrakech sightseeing. There are some many things to do and the list is endless. Thanks for showing an insight of this great place. All these tips are very much applicable. Thank you Amanda, this is perfect! My girlfriend and I are visiting in November and this is super helpful! This is terrific – thank you! Besides Fes Al Bali, are there other places you would recommend for leather goods? Would you go to places around the tannery or are their prices inflated for the tourists? Personally I think places near the tannery are inflated price wise. The best price is always going to be in the workshops where people are making things so be on the lookout for this! Most of the places near the tannery are just resellers that buy from the guys that make the products so their prices will be higher.